100 Planos Arquitectura, a Portuguese firm, has recently designed a new pavilion named Flower Power. The objective of this project was to create a structured model, multipliable, capable of creating ephemeral spaces or buildings. The need for a small pavilion at the Vila do Conde museum’s garden, where children and adults can rest and pause for some time during a visit to the museum, was the ideal starting point for exploring this idea of multiplication. 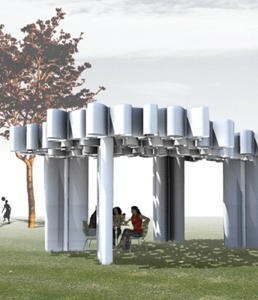 The basic module is a "flower" of 1.00 m diameter and 0.50 m high, with four petals, constructed of polycarbonate with plates of 5mm and PVC pipe ø 0,10 m. Assembling several modules with different heights, 100 Planos designed a waving horizontal surface, which, when suspended, creates a covered area. Here and there the "flowers" go down to the ground and become pillars, walls or partitions. 100 Planos decided to call it "flower power". It is a pavilion under which you may rest, dance, read, sleep, or simply admire the sky cut by translucent flowers.